As you may recall in March I posted that I had taken Greg locally for lunch to celebrate his birthday. If you re-read that post you will notice that I mentioned how perfect I thought the location was for a perfume studio. Since that very auspicious day I've been back to the location several times negotiating the contract for a space and conducting a few photo shoots. Yesterday afternoon, Roxana Illuminated Perfume, acquired a sweet studio/showroom/teaching space in Agoura! That was the BHAG, big hairy audacious goal, I mentioned a few days ago. It's been a bit of a wild ride, especially getting the details of the contract worked out. "April was clearly a significant turning point for the world. April marked the Cardinal Grand Cross astrologically. (snip) In essence, if anyone was waiting for signs to go ahead, to move from one place to another, to shift gears, to change, to finally pass to a different stage of life, to step into new levels of understanding this is the time!" Although I've been getting lots of signs that this space is a good move, having read what Mario wrote right before going to sign the contract made everything lock into place. Agoura is within the Santa Monica Mountains off of Kanan Dume Road which connects to Malibu. The location presented itself rather spontaneously as if it were looking for me. Here's a snapshot of the exterior space which is on the top floor of the atrium. It's the one with the door and big bay window. I won't actually be in the space until the renovation gets done. I'm intending they will finish it within the month, but, usually those things take a lot more time than expected. The space is already segmented into three part, which is perfect for a lab, a showroom and a teaching/consultation space. Since I expected to sign the lease soon, this past weekend I was hunting for items that might work well for the interiors. My intention is for the space to have a sophisticated vintage, apothecary charm. 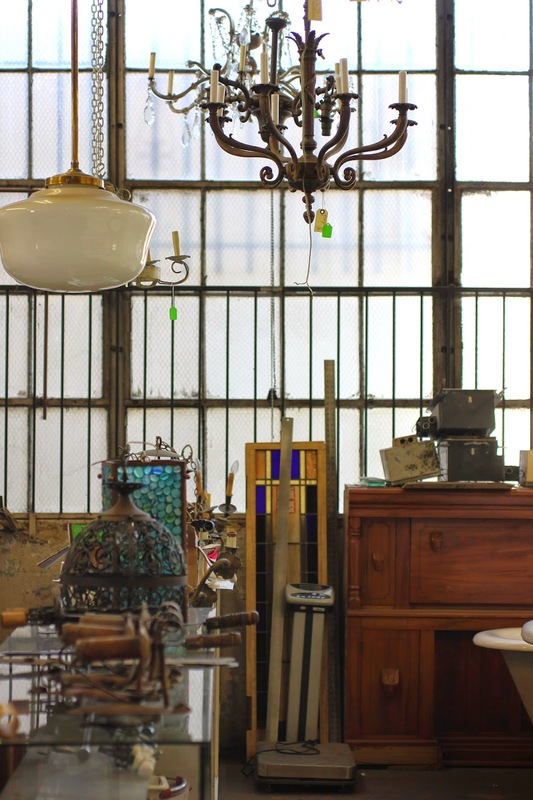 Conveniently the Agoura Antique Mart where we did the photo shoot has lots of inspiration to pull from. For example, in the front area, where the showroom will be I was planning on having three chandeliers. On Saturday at the Topanga Vintage Market I found a very well priced vintage dress form which was love and first site. Then on Monday Greg and I headed into downtown LA for a banner he needed for an upcoming show and decided to stop in at The Santa Fe Wrecking Company salvage yard. What fun that was! There I purchased three beat up crystal chandeliers that will be repaired for the showroom of the shop. In the my work/lab area I'm thinking of going a little more rustic with reclaimed wood and pipe for the counters unless I come across some well priced vintage apothecary items. I'm not sure how I will manifest all that I need for the space, a crowd funding campaign is a possibility. The gals who were in the space started clearing there things out today. First thing that will happen is that the fireproof fabric on the ceiling will be changed from black to white, the walls will be repaired, prepped and painted. I'm going to go with Sydney Harbour Interior Distemper paint for the walls in a natural tone with white trim. I will share photos of the process as we inch along. 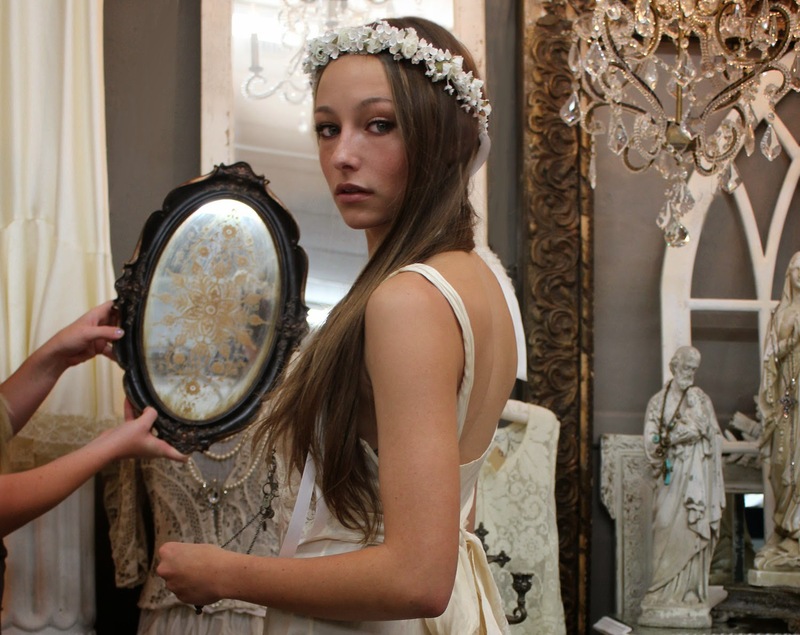 The photos in the first part of this post were taken by Greg at The Agoura Antique Mart, the floral crown is by Emily of WhichGoose. 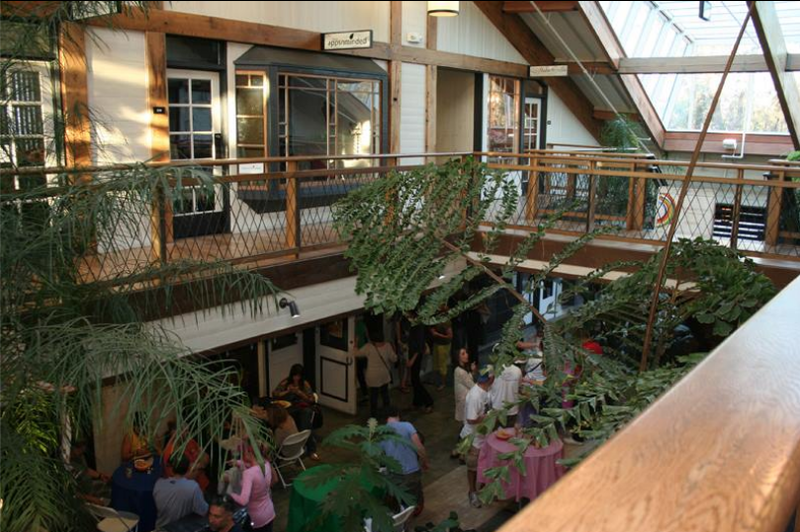 The photo of the atrium was found on the internet. Photos of the Santa Fe Wrecking Company were taken by me. What a joy to watch each intention slowly manifest itself into material form. Always exquisite. Looking forward to the full experience.